If you will notice from our text, the cluster of grapes that was cut down was of such a size and weight that it took two men to carry it. Grapes are often used symbolically in the Bible. For example, Israel’s sin is compared to wild grapes in Isaiah 5:2. The sins of the rebellious world are judged in “the great winepress of God’s wrath” (Revelation 14:18-20). Yet grapes are most often used in a positive way in the Bible. Grapes symbolize abundance and prosperity (Numbers 13:23). They also symbolize the divine blessings of God in the ages to come (Amos 9:13). 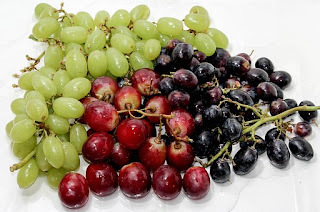 In my study for this devotion, I was surprised to learn that there are over 6,000 varieties of grapes world-wide, but only fifty of these varieties are commercially important. In America, the two most popular types of grapes would be the Concord (it is your large purple grape) and the Thompson seedless grape. This one is the most popular grape (by sales) in America. Its light green skin is tart in taste, but the juicy sweet meat is most of the taste. Grapes are the number one selling fruit in the world, sometimes dried for raisins, or crushed for juice, or canned for jelly and fruit cocktail. They are used in salads, desserts, pies, etc. Eaten alone they provide a low-calorie snack. Like all fruit, grapes are good for your health. They help to detoxify the body and help build iron-rich blood. Grapes taste good and are good for you. Grapes remind us of the blessings of God. So the next time you eat a grape, let it be a reminder to you of God’s blessings in your life. ✞ When you see grapes, remember the blessings of God.